When a true statement lacks certain facts and is intended to deceive, we often refer to it as a half truth. If a mother, omits certain recipe ingredients in order to promote good eating, we refer to it as well, good nutrition. “I’ve never been an Agatha Christie fan. Every book that I’ve read of hers was incredibly dry and predictable.” This statement is true but ineffective as the reader may have only read one Agatha Christie novel. “I’m concerned with her management skills. I once saw her strike one of her employees.” The manager in question may have indeed struck a worker however, if it was to swipe away a menacing mosquito, then the context is misconstrued. After failing a sobriety test, the middle-aged business man slurs, “but I’ve only had one margarita!” Assuming that the man was of average height and build, we need to question the size of the margarita. Perhaps it was served in a gallon bucket or perhaps there were other adult beverages consumed along with it. And finally, when asked what type of soup we are having for dinner, the mother replies, “it is roasted vegetable soup.” Ah, yes, it is fully true yet it omits the specific details. After my red velvet brownie incident, I learned that I needn’t be completely forthcoming with all recipe ingredients. After all, why spoil a perfectly good taste sensation by complicating it with details. Yes, I’m aware that this is at odds with my philosophy when buying food or eating out. I want to know what it is and where it came from. As the parent however, I uphold this duty for my children and believe that use of the occasional half truth may expand their palates and perhaps contribute to their greater well being. While you may disagree with my tactics, you can’t fault the outcome of empty soup bowls. Preheat oven to 400°F. Arrange the vegetables on a large baking sheet. Brush or drizzle vegetables with oil then roast them for 40 minutes. Remove from oven and scoop eggplant from skin into a heavy, large saucepan or soup pot. Peel the red pepper. Add the rest of the vegetables, the cumin and cayenne and the broth and bring to a boil, then reduce to a simmer. Cook until onion is very tender, about 45 minutes (mine took longer). Cool slightly. Working in batches, puree soup in blender until it is as smooth as you’d like it to be. (Or, if you have an immersion blender, you can do this in the pot.) Back in the pot, add the cream and bring the soup back to a simmer. Season with salt and pepper. Serve sprinkled with goat cheese. Context is everything. Don’t you agree? Yes! I even do it with my 95 year old grandmother now to get her to eat more! My skeptical children now ask not “is there a vegetable in this smoothie?”, but “which vegetables are in this smoothie?” which causes me to squirm while answering. Generally they drink it anyway. The soup, Tammy? Looks delicious, and I’m glad to have more eggplant forthcoming in the farm share. Ohhh! That makes it harder, doesn’t it Kirsten? Hahaha! My mom used to do that to the four of us. Zucchini Bread was ABZ Bread. Squash Pie was Pumpkin Pie. Etc. Yes, they ate it right up and didn’t question it Nancy. It’s a lovely soup. I would like your soup no matter what! Sounds yum-yum-yummy! Thanks for sharing the soup recipe. I use the same tactics, though they often don’t work with my husband, which tips off my daughter. I keep trying! We have to keep at it, don’t we Danielle? Seems like you’re going to get more into that world with your recent activities, eh Charlie? Thanks for the affirmation Tandy. My mom used to do the half truth trick so me and my sisters will eat healthier. Now, I’m doing the same thing for my son although lately he is eating fruits and veggies. He even request that we make him lunch and snacks for school. Thanks for sharing a very helpful post and yes, another delicious recipe. Best wishes to you and your family. The soup is easy and very delicious. if you leave out the goat cheese, it is vegan. It must not be vegan for me you know. I eat meat & fish too! I love the addition of goat cheese! As long as it tastes delicious, half truths are perfectly acceptable. This soup is beautiful, and sounds delicious! Thanks! It would freeze well also. If only I wouldn’t have let on! a wonderful way to use eggplant–which I love, but kids generally do not. (I remember well, as I was one of those very picky ones.) Roasted and pureed, eggplant has a delectable flavor that even those self-proclaimed eggplant haters like…especially when they don’t know it’s there. gorgeous soup. I can’t imagine why I hadn’t thought of this before but it works very well. Loved it, we have some veggie patties we make with everything we’d love the kids to eat, but they might sniff at, and they love them, and now they dont care what is in them. You made me chuckle, I always enjoy visiting your blog. Veggie patties are a great idea also. Delicious looking soup that I will try this week: Summer has become suddenly very cold and rainy. 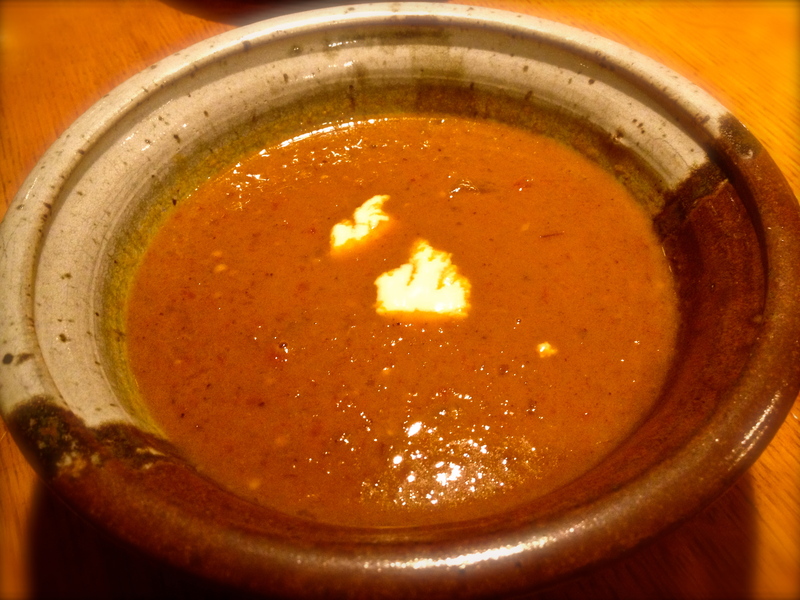 Your eggplant soup is the True recipe for such days. Thank you Tammy. Oh, I’m glad I missed the cold rainy bit! Soup is always comforting to me. Tammy, I have a abundant supply of egg plant and will be making this x 3. Freezer space is tight, how about pressure canning it? I sure think you could try it. I have canned in the past but unfortunately, I’m not as knowledgeable on the topic as I’d like to be. The canning was a success! It is pretty to look at as well. Thin ribbons of the pepper show up as I used red and yellow. I did a lot of research into the canning process part of it. I didn’t want to make anyone sick. I did everything except the cream and cheese. Dairy products do not hold up well under the pressure canning process. Because these are low acid ingredients despite the tomato, it has to be processed in a pressure canner. For pint jars; 11 pounds pressure for 30 minutes. This looks gorgeous! I’m dying to try it. It’s very easy and I’m pretty sure you’ll love the taste. Next time I get eggplant from my CSA, it’s a done deal. This is one of my kitchen truths! I guess I think half truths have a place in the art of cooking. A chef shouldn’t always be obliged to reveal or share all her ingredients or recipes, should she? I think not. You’re right. There’s always been a secret ingredient, hasn’t there? I did it again last weekend without the tomato and carrot. It was eggplant, onions, garlic and then I added roasted chick peas. It’s a modified Martha recipe and it was terrific.